Hello! Welcome to my first post of my holiday vacation in Pensacola Beach, Florida. Yesterday I posted some pictures of the beach to just help bring some warm cheer to everyone who is suffering from these miserably cold temperatures. Starting today however, I want to go into greater detail of everything we did and saw in Pensacola. And we did a lot, so even though we were only in Pensacola for four days, it will probably take about eight posts to cover it all; so bear with me if you only visit my blog to see my creations. Pensacola Beach is located on Santa Rosa Island, which is a barrier island in Florida. It is a very narrow strip of land that you get to by traveling over two separate bridges on the Gulf of Mexico. It is really amazing how much is built on this narrow strip of land. You can literally see both sides of the water (in certain areas) when you drive on this island. After spending three days in the car (we broke the trip up into short 6 to 8 hour drives), when we finally got to Pensacola and saw the Gulf our jaws just dropped to the floor. We had never seen a more beautiful area in our lives and were simply awestruck by the color of the ocean, the gorgeous sky as the sun was starting to set, and how pretty the city and town was. And we loved the long bridges going over the water. What a beautiful, scenic drive! This is the view from the balcony of our room. I never tired of standing on my balcony looking at this view and hearing the sound of the waves. Every morning my husband and I woke up with the sun (while the 20- something 'kids' slept in) and ran outside to watch the sun rise. I didn't bother with make up, I wanted to get out on the beach as soon as possible, so I just threw on some clothes, grabbed a cup of java in the hotel lobby, and made a run for it. I didn't want to miss a second of a sunrise. This is the back view of our hotel as the sun is starting to rise. There were so many different types of sea birds that I never get to see in Wisconsin. I couldn't believe all the different herons I saw. Some were very friendly, and others were very skittish. They all had such different personalities. After we spent a couple of hours on the beach watching the sun, the birds, and collecting shells, my husband and I had a leisurely breakfast and then went to wake up 'the kids' so we could begin our day. After a brief stop at the visitor center, we made our way to Big Lagoon State Park. It is a 655 acre State Park located on the northern shore. It is a very marshy community and it is home to a lot of wildlife so we were hoping to see an alligator, but to my son's disappointment, we did not. We did however see lots of interesting birds like the heron below. He let me get so close to him, and he never moved off the pier. He did growl at my son when he got too close however. 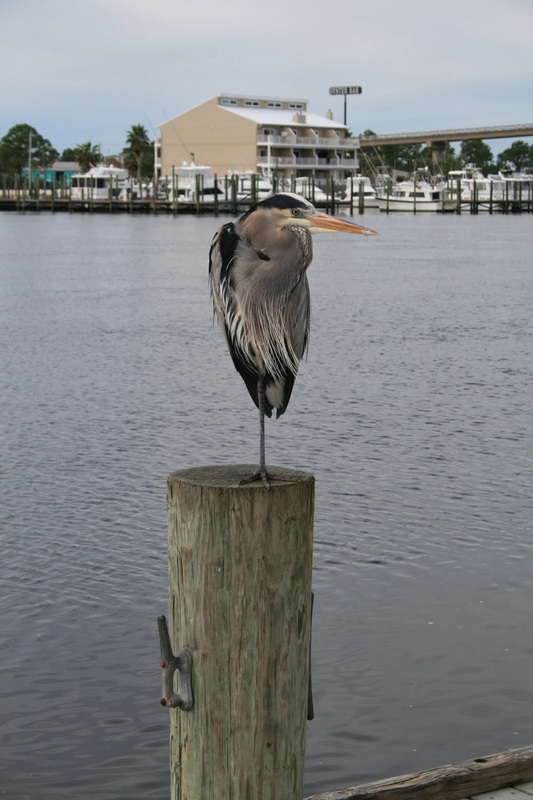 My son-in-law Jason decided to imitate the heron. It's a good thing he has such good balance and didn't fall in the water! The park has a beautiful, well paved road that you drive on to explore the area. There are many nice, large parking lots to pull over and stop. Our first stop was actually a boating dock and is where we saw the first heron. The pine flat woods in this area was so interesting to someone like me who is use to the Wisconsin Woodlands. There are many boardwalks and scenic overlooks to view the saltwater marshes. That is my husband on the left and my daughter and son-in-law on the right. Although we saw alligator warning signs, we never saw an alligator….and we looked really hard! But with such dark water, I think he'd be very hard to see! That's my husband pretending he lost a limb to an alligator. Such a funny guy! A navel base is just a few miles away, so we saw the Blue Angels flying several times on our hike. On my next post, I'll discuss our trip to the Naval Museum. What an adventure that was! Other than the unique vegetation, which I had never seen before, I was awestruck at how peaceful it was. Of course, we were visiting the park during the off season, so we only ran into one other group of tourists. But I couldn't believe how still and quiet it was…all I could hear was the singing of the birds and the occasional roar of a Blue Angel engine! LOL! During the warmer months, visitors use the park to camp and swim, people also boat/canoe and fish for crab in the shallow waters. What a stunning place!! Looks like a place you could go back to in your mind and feel centered and calm! I love it! :) Thanks for sharing! Some more awesome photo's, so glad you share!! Your view from that balcony is SO beautiful! The beach is my favorite place on earth, so peaceful. Looks like a wonderful trip!